FROM BROOKLYN’S COMMUNITY OF ARTISANS I’ve learned how important it is that skills with traditional tools should not become lost arts. At first it was hard to apply this insight to my own work, for I am a journalist. But reading John J. Kochevar’s recent piece on artisanal writing with pencils inspired me. This vintage rotary in working order sells in the neighborhood of $50 at Etsy.com. Here is the missing manual for another traditional reporter’s tool. Master this, and you step into a stream of greatness: Edward R. Murrow, Woodward and Bernstein, Lois and Clark. 1. 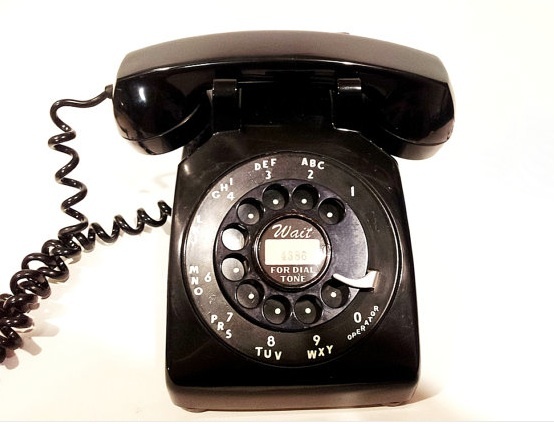 The dial is the round object in the center of the phone at right, with a series of evenly spaced holes running along the perimeter of the disc. 3. Move the finger in a clockwise fashion until it rests against a thin stop, usually located on the right side of the dial. Remove your finger, and the dial automatically returns to its original position. 4. Perform the same operation for the subsequent numbers that you wish to dial until you‘ve completed dialing the entire number. Once connected to your party, remember to keep your fingers a safe distance away from the dial to avoid service interruptions. Note: A rotary dial telephone can not be used for texting.